Serving people through a ministry or taking care of children, aging parents, patients or clients are all incredibly rewarding. But, it can also be very stressful. Stress can lead to poor eating habits, illness or disease. But, leaving our job or our ministry isn’t always a good option, especially if that is our calling. And, we can’t just stop the responsibility of being in a family. We also can’t prevent our parents from aging or their need for our help. It seems as our children grow up and our parents become older; it gets busier and more and more stressful! That said, I’m sure I don’t have to tell you that all of that busyness and stress is not good for our self-care. But, what do we do? Just ignore it? Well, can I tell you? Doing nothing wasn’t working out too well for me, I had to do something different. And, I’m guessing that if you’re still reading this, you might be thinking the same thing? As a Christian, you can use faith to strengthen your self-care. And specifically, I mean we can use our faith to develop, and then mature, faithfulness. 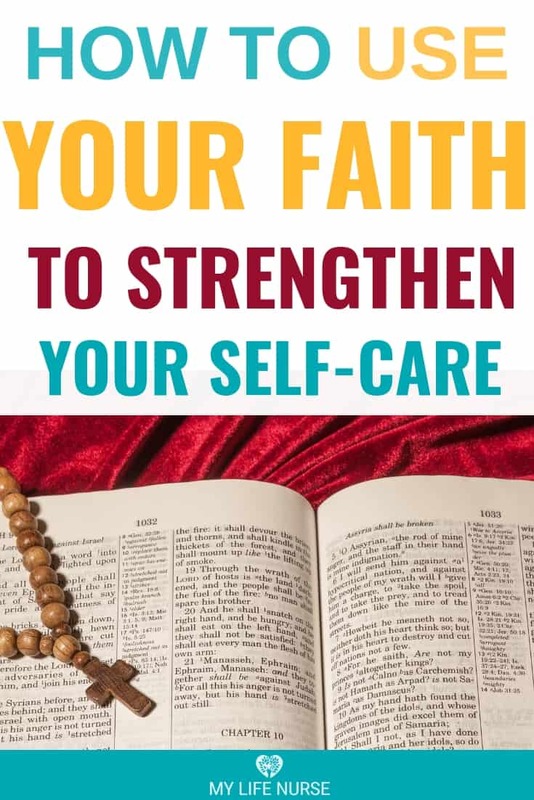 I have to confess that talking about how to use faith to strengthen your self-care hasn’t always been in my vocabulary. It used to be that my ‘keep on swimming’ mantra dried up by noon and left little for taking care of me. Heck, there were days I wondered if it was even possible to take good care of them and me. It always seemed like an ‘either or’ situation. But it’s possible and I live it every day. Read on the learn how to make it possible for you! Faithfulness is the seventh fruit of the Spirit and is the operative word for, and the living out of, your faith. Synonyms in the dictionary include adherence, adhesion, allegiance, constant, devoted, fidelity, loyal, resolute, trustworthy, and steady – among a long list of others (look it up – you’ll be amazed!). This positive and active attribute of character is a much-desired characteristic in people with whom we have relationships. So, how amazing would it be to allow the development of it in our relationship with the Lord? And then how we relate to ourselves while doing our self-care to honor Him? Whether caring for little ones, school-age, tweens, adolescent or adult children, when caring for aging parents, working at a job taking care of or serving other gets thrown in too; we have a lot on our plates. Some of us also work outside the home or run an in-home business, volunteer, serve at church or try to spend time with their spouse once in a while. I think we would all would say we don’t have time for ourselves. Whatever self-care we were doing before parenting started got pushed to the back burner. And, as time moves forward, the idea of starting something new seems impossible. At least, that’s what happened to me. I feel like I should share my experience so you can prepare if it happens (or is happening) to you. In a nutshell, as the days fly by and the tasks mount up, you might begin to feel like you CAN’T put your self-care first. You might feel like you (and your self-care) are not the priority anymore. And, many days you don’t actually feel like it is ok to put yourself as a priority. So, you stop making self-care a priority. That works ok for a while. But what happens if you go through what I went through? Where one day you wake up, look around and realize you’ve ‘lost yourself’? What happens if you’re embarrassed by what you see in the mirror – or what happens when you don’t even recognize yourself? What do you do then? If you’re like me, you might wonder if you have a fighting chance at getting back to where you once were. Or, you might wonder if it is even worth it. You know what? Scheduling AND KEEPING time with God erases ALL of these lies and worries. Spending time in Scripture provides the validation that we ARE worthy, and taking the time to care for ourselves is healthy and essential in the Lord’s eyes. He is God the creator. He could have created us to be maintenance-free. But He didn’t make us that way. So that means taking care of our bodies, minds, and soul is what God expects from us. Scripture teaches that God is the standard and the source (through the Holy Spirit) of faithfulness. Jesus lived out and demonstrated the example of devotion in the New Testament with His disciples and followers. And now, the Holy Spirit is ready and able to bring this character trait to full maturity in our lives today. How do we allow the Holy Spirit to do this? The development of faithfulness requires faith! Pastor and author Robert Strand once wrote: “Faith and faithfulness are closely linked–faith being foundational to all that we believe and act upon. Faith is that undefinable power through which we realize as reality things that are as yet unseen. Faithfulness is the working out of this in your belief system. When we have faith in God, we act in faithful ways. Acts of faithfulness are the demonstrations that we have a true faith in God and such acts are the threads holding our belief and behavior systems together.” (taken from ‘Faithfulness a devotion series by Robert Strand Nine Fruits of the Spirit’ pg. 12). When we believe that God exists and that He will respond to us for passionately calling out to Him, we are pleasing the Lord! That’s a win-win! An expectation to make time for your self-care and a way to please the Lord. So, make it a point now to start scheduling and keeping your time with God. Got a busy family? 10-15 minutes a day is a great way to start and is entirely possible! 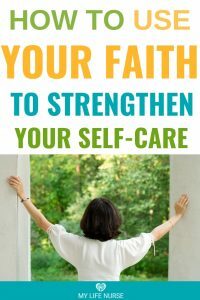 I had never used faith to strengthen my self-care before, but prayer taught me how to make it happen. There are lots of ways to do this, but it can be as simple as just asking God to help you take care of yourself. In the past, I separated my physical, mental, emotional and spiritual needs in prayer. We don’t need to do that; we are living beings with all of these systems woven as one. Psalms 139:13-14 reads, “For you created my inmost being. You knit me together in my mother’s womb. I praise you because I am fearfully and wonderfully made; your works are wonderful, I know that full well.”(NIV). God knows exactly how each individual one of us needs help with our self-care. God wonderfully made us and knitted us together. Taking care of our physical needs is just as important (and not separate from) the importance of taking care of our spiritual needs. The Lord already expects us to talk to Him about all of our needs. Scripture also teaches us that He is pleased when we take care of our body in a way that is honoring to Him. One example, Romans 12:1 reads, “Therefore I urge you, brothers and sisters, in view of God’s mercy, to offer your bodies as a living sacrifice, holy and pleasing to God-this is your true and proper worship.” (NIV). When you offer your body (and the loving way you care for your body) as a form of worship, it is pleasing to the Lord. The Lord sees you and your body as valuable, so the care you give to your body is worthy too. Therefore, you also need to look at yourself and your self-care as worthy. You see, you are precious to the Lord, and it is essential to take proper care of yourself. Finally, aren’t we happier caring for our families when we rest and are well spiritually, physically, mentally, and emotionally? Bringing self-care into your prayer times can prevent resentment towards your family. Resentment can squash your joy in the service of parenting, caregiving, and serving, especially when your family IS your mission field! When you start talking about self-care during your prayer time, you’ll find you will also begin to bring prayer into your self-care. God becomes a natural and comfortable part of your self-care routine. Fulfilling a calling from the Lord can seem utterly impossible when you are taking care of your family’s needs. I remember getting lost in the list of to-dos and the chaos of a caregiving schedule, the barriers, and the stress to the point that I could never get around to fulfilling my calling. I even knew what God wanted me to do! But, how do you say no to the ones you love so dearly? Back then, after much self-care prayer time, I learned that I was overtaken with the feeling that I couldn’t say no to anyone. And, with the Lord, I realized I didn’t attempt to control my schedule because I made pleasing others and making everyone happy my idol. I didn’t see it until I spent a lot of time with the Lord about it, but there was a reason behind my idolatry. I was afraid I was going to mess up my children. Fear is a huge barrier to lots of things, including taking better care of yourself. I didn’t want them to fail! I thought that doing everything for them, which was micromanaging them, was my role and that I was helping them. But the truth – I was doing too much! When I stopped, I found I had time for my self-care and my calling for the Lord. God is always faithful. He delivers on His promises. And He is continuously in control. Worshipping only God (and not my family or pleasing others) allowed me to build confidence and trust in God’s faithfulness to my family and me. Eventually, I learned that my children are going to fail. And that this was not a necessarily a reflection of my parenting, but just a part of growing up. Sometimes it was even a part of God’s plan. God uses everything for His good and human failings may teach or prepare us for something more significant in God’s plan. Nonetheless, it is not appropriate to take ownership of other’s failings-especially when it interferes with time for our self-care. I also learned how comfortable my trust and obedience to the Lord could be. When I surrendered to God’s will and timing and trusted God’s faithfulness, I felt an overwhelming sense of calm. This commitment led to an appropriate level of control of my future health and wellness. God can handle all of my family’s needs! Finally, when I surrendered to worshipping only the Lord, trusted Him to respond to me for seeking Him and asked Him to help me with my self-care, He equipped me to do so. It all started with knowing I had more time in my schedule (because I wasn’t doing everything for my family). Then, I wanted to be at my best to serve the Lord and work for Kingdom growth. Surrendering to God’s will and timing helped extinguish my fears – the driver of my micromanaging actions that took me away from taking better care of myself and fulfilling my purpose and calling for the Lord. Like so many of you, when caring for my family became my priority, I found several self-care ‘shortcuts.’ I figured I was young and in good health so that I would be okay for a while. Over time, I realized how easily ‘a while’ can turn into years. One morning I woke up and realized I couldn’t wait any longer to take better care of myself. This sounds like a great thing, right? I was so burdened with worry and fret. All I could think was how monumental my task was. I mean, how do you fix years of basically just coasting? How do I adapt and change all of the habits I’ve developed over the years; the shortcuts, the cheats, the quick and efficient methods I’ve designed to get everyone out the door just in time for today’s deadline? It looked like a HUGE change was going to be required. Something BIG will need to happen to fix ‘all of this’ (insert your favorite ‘hottie’ cliche here!). I sorta knew the wake-up day was coming. I had already tried to change a few habits. But I couldn’t stick to any of them. Every time I decided to replace one, someone in my family needed something changed, moved, altered or otherwise, and I wasn’t able to keep with it. I remember thinking that it’s not just me I’m changing here. It’s me and the big long, heavy-as-a-sea-monster tail behind me called my family. Anything I try to do has to be significant to work for my family. And I can’t pull all of that weight. I can’t. I’ve already tried to change things, and I couldn’t make it happen. How in the world can I change all of us? And eventually, I wasn’t sure it was even worth starting because I couldn’t handle the feeling of failure over and over! You know what? God is so good. I mean it. We don’t have to feel like we have to make big changes. And we don’t have to do it ourselves. That is the beauty of developing and maturing faithfulness. We can put our efforts into trusting that God will help us change and improve through the Holy Spirit. When we commit to spending time with the Lord, bring self-care into our prayers (and then prayers come into our self-care), surrender to God’s will and timing, we are changing! He takes us on this journey, and we see how little steps of obedience build and strengthen our faith. Then, we trust Him more. And even more. Proverbs 3:26 explains, “for the Lord will be your confidence and will keep your foot from being caught.” (ESV). “He will cover you with his feathers, and under his wings you will find refuge; his faithfulness will be your shield and rampart.” (Psalm 91:4)(NIV). When I do all of the things above, the Lord reminds me He is present with me always. As I believe He is present and I seek Him through faith that He WILL respond to me for earnestly seeking Him, I find peace, protection, and strength. When we take care of ourselves and work to honor the Lord in the process, we take steps of faith. The Lord will accept our actions of faith as obedience. It happened to me, and I believe it will happen for you. Increases in the faithfulness of the Lord reduces the fear within us. Trusting God with the journey and leaning on the Holy Spirit will give you the bold confidence to keep going! 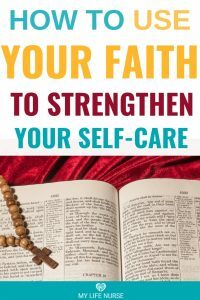 In closing, I know I wrote a lot of information about how to use faith to strengthen your self-care. However, I want to see that there is really only one starting place. And I know you can do it. Schedule time with God, and stick to the meeting time with Him. Bring your self-care needs, fears, and requests for your prayer time. I believe He will lead you to the next steps on your self-care journey. And, friend, I believe in you. Get started RIGHT NOW! 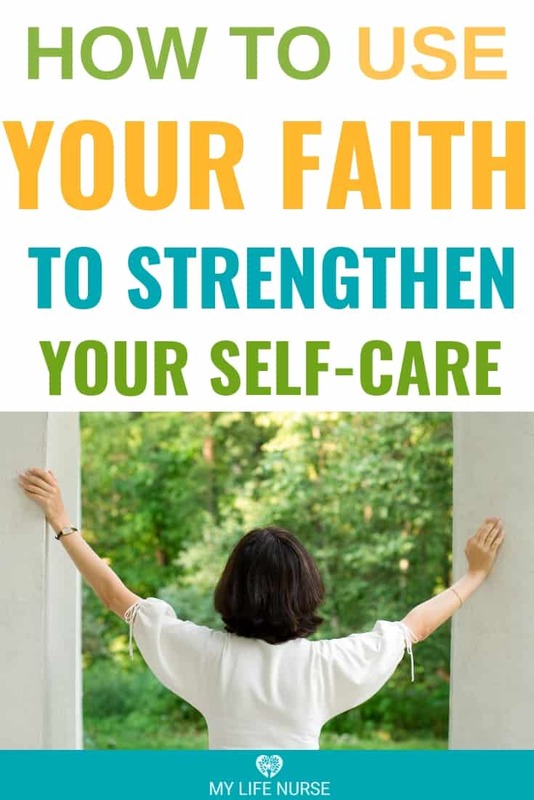 Subscribe to the My Life Nurse Newsletter and receive a free Self-care Scripture List to download. Enter your best email in the box below to get your Scripture list! Want to remember this? 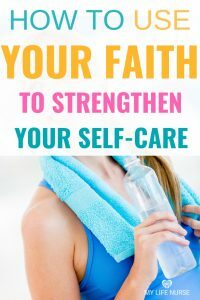 Post this How to Use Your Faith to Strengthen Your Self-care article to your favorite Pinterest board!